Authors: James Threlfall, Thomas Neukirch and Clare E. Parnell at the University of St Andrews; Philippe-Andre Bourdin at IWF, Austrian Academy of Sciences. Understanding the behaviour of charged particles in dynamical solar processes (particularly those underpinned by magnetic reconnection) is fundamentally important for plasma behaviour in general, not least to uncover how vast quantities of electrons and protons are accelerated to high energies during solar flares, micro-flares and even nano-flares. Magnetic reconnection was first conceived as a way to explain the generation of high energy particle populations during a solar flare  and has been shown to be intrinsically associated with an electric field component parallel to the local magnetic field . Several theoretical approaches are used to test the local plasma response to dynamical solar processes. Fluid models (using magnetohydrodynamics, MHD, for example) omit any response on a particle level due to differences between fluid and particle scales. Conversely, Particle-In-Cell (PIC) models can fully describe the interplay between particles and global fields, but with often severe restrictions on simulation box size and parameter regimes. Figure 1: Hinode magnetogram and EIS images of target region, with (R) simulated electric field using  (pink/purple regions oppositely signed E|| regions, with opacity proportional to field strength). In this nugget, we outline our recent approach which lies between the two, using gyro-averaged relativistic guiding centre motion to study the particle response to realistic (and non-flaring) solar active region fields , based upon cutting-edge, high resolution MHD simulations which accurately reproduce aspects of the original observations  (shown in Figure 1). Similar combined particle/MHD approaches have often been used to study isolated topological features or structures, listed in e.g. . In , we extend this process to encompass a full solar active region (AR) for the very first time. To get a sense of the general particle response, we studied 2000 electron/proton orbits initiated on a uniform grid (in position, shown in left panel of Figure 2, with a constant initial pitch angle and kinetic energy) and use a single snapshot from the simulations of  as the global environment. Figure 2: Initial and final electron positions (colour-coded by KE gain) above Hinode magnetogram, with interpolated magnetic field lines (grey) and regions of oppositely oriented high E|| (pink/purple) for reference. The vast majority of particles are ultimately accelerated to between 50-500keV (right panel Figure 2), caused by extended regions of strong E||(=E.B/B), with a peak energy gain of 42MeV. The chosen simulations  are designed to reproduce features observed by various Hinode instruments, but (due to numerical constraints) include a magnetic Reynolds number close to unity. This choice reproduces the desired observed imaging effects (such as loop structures and down/upflows as seen by Hinode) but at the cost of unphysically large (often super-Dreicer) electric fields throughout the domain. The most highly accelerated electrons impact either the model photosphere or the side-boundaries. Such behaviour is common in a flare-producing region, but rather surprising for a non-flaring region such as ours. Interestingly, many electrons which achieve >10keV energies appear to be retained in the centre of the domain, despite rapid acceleration to relativistic speeds. To investigate why so many accelerated particles are retained in the domain centre, we studied individual particle behaviours. These quickly ruled out the magnetic mirror effect as the root cause of the “trapping”, while confirming that drifts (primarily the ExB drift) can significantly contribute to particle trajectories. The culprit for the observed “trapping” was found in regions of oppositely oriented electric fields, between which an electron or proton would be repeatedly re-accelerated. Both electrons (left panel of Figure 3) and protons (right panel of Figure 3) could easily be trapped between such regions; in some cases, one species may escape from a position where the other cannot (right panel of Figure 3). Rescaling the electric fields in the simulations by factors of 0.1 and 0.01 to more physical values had minimal impact on the numbers of particles trapped by this mechanism; orbits simply took longer to travel between the smaller regions and be re-accelerated. Figure 3: Examples of a single electron (L) and proton (R) which become “trapped” between regions of oppositely oriented E|| (R also shows a case where an electron starting in the same position may escape). 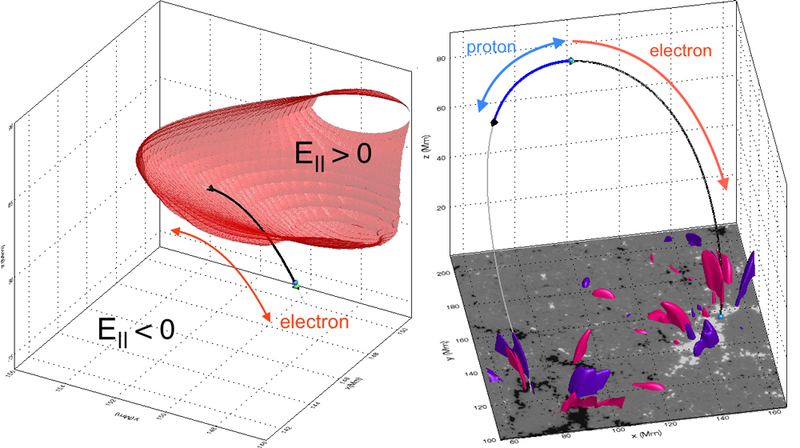 The particle motion which results from combining high resolution MHD AR-simulations and gyro-averaged test particle orbits is dominated by the presence of extended strong parallel electric field regions. This manifests in runaway acceleration to MeV energies (despite not modelling a solar flare) and a novel electric-field trapping of the majority of orbits considered here. Although the former result is questionable and arises in this case due to the physically unrealistic magnetic Reynolds number of the numerical model, the latter result is robust and could occur anywhere there are parallel electric fields of opposite sign. Weakening the simulated electric field strength reduces the amount of acceleration but does not significantly affect the efficiency of the trap. This study strongly suggests that the design of future large scale MHD simulations should also take into account the electric field configuration resulting from the chosen simulation parameters (including, e.g. magnetic diffusivity), in order to better reflect the physical behaviour of the target region of the solar corona. Full implementation (& documentation) of our relativistic particle orbit code can also be found at https://github.com/jwt104/party_orb.